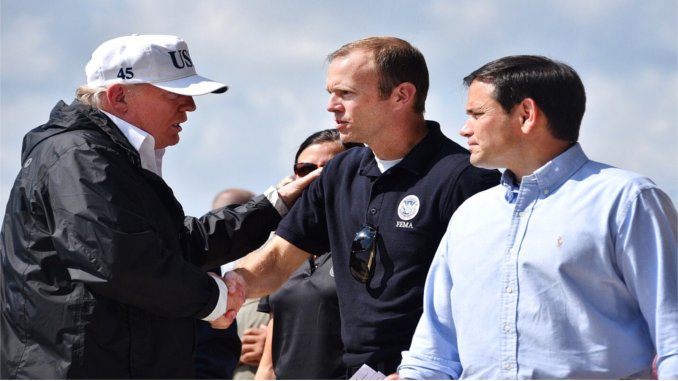 FEMA Administrator Brock Long on Wednesday announced via Twitter that he was stepping down from the agency. Long writes that while working as the FEMA Administrator “has been the opportunity of,” a lifetime, it was “time for,” him, “to go home to,” his family. Long also announced that upon his departure that FEMA’s Deputy Administrator Peter Gaynor, will be the acting FEMA Administrator. President Trump along with FEMA faced heavy criticism over their poor response to Hurricane Maria that left Puerto Rico without power for weeks. Long joins a long number of departures from the Trump Administration, for a full list, CNN or the New York Times. Jennifer Jacobs with Bloomberg was the first to report Long’s resignation via Twitter. SCOOP: FEMA chief Brock Long is planning to leave the agency, sources say. Could be announced as soon as today.